I’ve often wondered to what degree Gov. 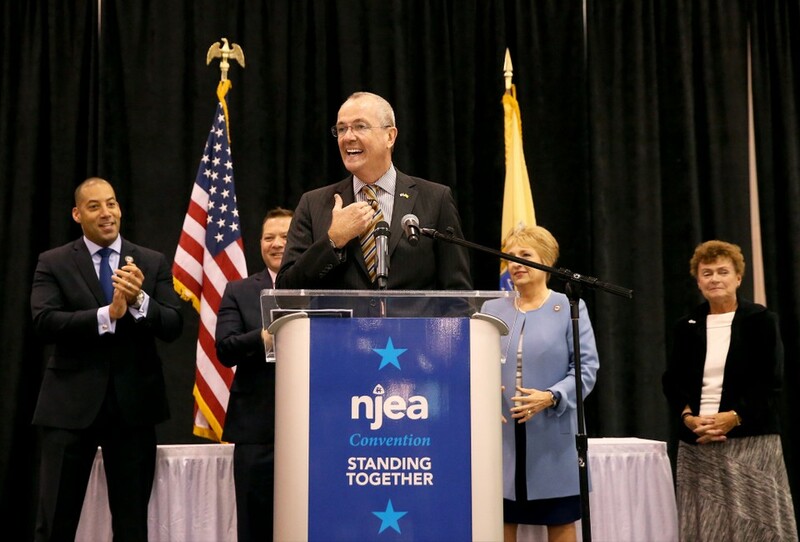 Phil Murphy’s agenda is driven by the wonts of NJEA, New Jersey’s primary teacher union. After all, his election platform practically replicates NJEA’s wish list: fully fund pensions, fully fund the state school funding formula, stop charter school expansion, eliminate the link between teacher evaluations and student outcomes, eliminate PARCC tests. And so it should come as little surprise that his deputy Chief of Staff is actually a former NJEA executive. Maybe I should have known this already. I didn’t. When I saw recent press on Deputy Chief of Staff Deborah Cornavaca, everything fell into place like pieces in a game of Tetris. Duh. Cornavaca was recently in the news because she took part in a conference call that strategized how to take down Senate President Steve Sweeney’s “Path to Progress” plan, which is intended to address N.J.’s dire fiscal condition, currently 48th out of 50 states for fiscal health. The biggest problem is our $90 billion unfunded pension liability. (For context, our annual state budget is about $37 billion.) And so Sweeney is proposing to do what countless other numerate leaders have suggested before: merging school districts, adding tolled fast lanes and cutting government employee health care and pension benefits. One legislative source said this appears to be “a declaration of war” as Murphy heads into negotiations with Sweeney and other fellow Democrats who lead the state Legislature on what the next state budget will look like. That includes whether there will be new tax hikes…Sweeney said he’s especially angry the conference call came days after he, Murphy, and state Assembly Speaker Craig Coughlin, D-Middlesex, reached a deal on legislation to gradually raise the state’s minimum wage to $15 an hour by 2024. If you go here, you can listen to a tape of the call procured by the Ledger. Who exactly is the Governor relying on for counsel? Cornavaca created a “GoFundMe” page to get money for anti-PARCC billboards on Route 17 and Interstate 80. That was when she was legislative director of New Jersey Working Families, a pro-union group that coordinates with NJEA. NJEA considers itself a member of NJWF. Neither group endorsed Sweeney in his last election; as everyone knows by now, NJEA decided to spend $5 million of member dues campaigning for Sweeney’s opponent Fran Grenier, a Trump-loving, climate change-denying, immigration for. Cornavaca is a member of Save Our School-NJ, the suburban anti-choice/accountability group. She co-signed a letter with SOS-NJ founder Julia Sass Rubin where they spoke on behalf of their organization, arguing against Christie’s school budget which actually increased school funding but not, I guess, by enough. Also as a member of SOS-NJ she spoke against PARCC testing to the South Brunswick Board of Education, which passed a resolution accordingly. An article about her appearance was published on a website called Truth in American Education, which defines its mission as anti-accountability and pro-local control. Murphy’s Chief of Staff is, I’m sure, a wonderful person and a great mom. But it would be hard to argue that she is objective about issues that are front and center on his plate: NJ’s fiscal morass created by an overly-generous pension and health benefits plan; mending fences with Steve Sweeney, an essential goal if he wants to achieve any of his goals during his first term; coming to terms with NJ’s pending lack of school accountability and public choices for families, largely of color and low-income relegated to districts that look nothing like South Brunswick where the median home price is $414,600. Remember that the last two-term Democratic governor in New Jersey was Brendan Byrne, who served from 1974 to 1982. Every other Democratic Governor in the last 35 years only lasted one term. Somehow I have the feeling that the late Governor Byrne had objective advisors with a broader agenda than that defined by NJEA. Previous PostThe Beatings Will Continue Until Morale Improves; Or, Is Kowtowing to Union Leaders Good for State Leadership?